3003 or 5052 aluminium for fan shroud. And is .080 heavy enough? I have a friend that wants help in making a radiator fan shroud for his dodge diesel truck. He wants to mount a duel electrical fan in place of the clutch fan. He is bracket racing this truck and he is noticing that the fan is engaging at times he would not want it to. The electric fan will give him the control he wants. Please, need suggestions on material and thickness. I have little experience with aluminium. I do have a good box break to bend the material. Somebody more experienced should surly have some ideas for me. Is .080 thick enough to surface mount a fan on to? Or should I be thinking thicker is better. 3003, assuming the heat treatment is the common H14 has an ultimate yield strength of 22 Ksi and a yield strength of 21 Ksi. It's hard to compare the 2 alloys not knowing exactly what the heat treatment it's had but in general the 5052 is the stronger of the 2 and the greater difference between where it bends and where it breaks means that it's more ductile at least until it work hardens from bending and vibration so I'd go with the 5052. No idea if .080 would be strong enough without knowing the overall dimensions, how it's mounted or whether you will incorporate reinforcement ribs or beads. Either way, be sure to thoroughly de-burr all the edges to prevent cracks from starting. Also careful to use a generous bend radius at least 1.5 times material thickness, bigger in this case is better. Thank you Bob. I am only asking about 3003 vs 5052 as that is what I have noticed others have used in other projects. I am certainly open to other alloys. Great advice on the bend radius. I had not considered that detail. Thank you. As to design, we haven't made any firm plans but the general design should be fairly simple. The factory plastic one is there and should be copied fairly closely. It has a two inch depth and is shrouded to fit the factory fan. I believe it currently has two mounting bolt locations on each side. We also need to accommodate two catch cans. One on each side. The opening will be cut to accommodate the new electric fan. We are just trying to decide on the material to order. Any other wisdom will be appreciated. Remember that strength is in geometry. Look at some of the stuff that Bill Trombley has recently posted. Flanged holes don't just look cool, they add strenght. Lips and beads add stiffness. Backer plates add strength to areas where things are going to be bolted on. A compound curve is vastly more rigid than simple rolls or flat planes. I have found this chart, from Aircraft Spruce and Specialty, helpful. 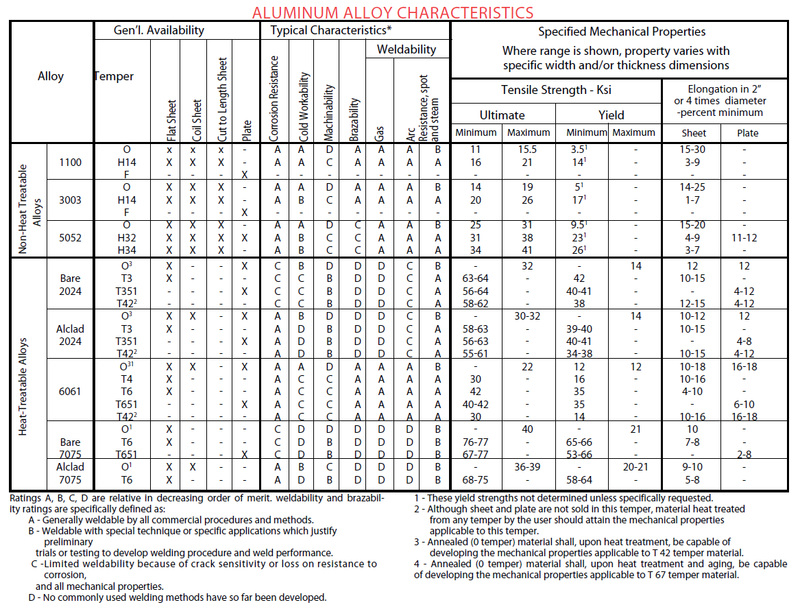 I look for alloys that are "A" or "B" rated for cold workability. Last edited by Jacob; 06-13-2018 at 08:53 AM. The .080 is a fine thickness for your diesel bracket truck, using 3003. Since 5052 is about double the strength of 3003, with both in half-hard, I would use .050" in the 5052. Remember your radius bends are more generous with the 5052 than with the 3003. Use 5356 filler with the 5052. Referencing a NACA report, actually, depending on the size and approach, lightening holes generally add weakness, which flanges recover, to a limited extent. If you roll a bead on the inside of the flange, if spacing and size recommendations are followed, you can approach the properties of an undisturbed sheet. That said, non-aircraft builders usually use metal that's more than required for the particular loads, so flanged holes may be "OK". Just raising the point for general knowledge. Last edited by Marc Bourget; 06-14-2018 at 09:57 AM. Reason: Added "the properties" to 2nd paragraph. Thank you Kerry, I will check Bill Trombleys posts. Will need to consider a flanged opening at the fan mount location, I see how that would make the panel much stiffer at the opening. We are trying to duct air via fan thru the radiators and intercooler am sure the mounting back panel for the fan will see a bit of flex forward and back. This truck is running a Cummins with a compound turbo setup and has run in the 11s. Currently dialed in at about 12.3. she moves pretty darn good for a heavy gal. Crystallographic, Thank you for the confirmation on material and thickness. I heard that the fan has been ordered and the material will be as well. 3003 in .080 has been selected. I do have a bead roller and we might incorporate one around the opening of the fan in lew of a flange. Will submit photos when progress is made. Please, anyone else has input it will be appreciated. No real input on your design/materials, but where are you buying aluminum from? My steel shop has limited aluminum down here in Colorado Springs. I'd like to find a supplier.